The leaves have started changing color around here, and Autumn is in full swing. We have more great new products to share that are perfect for this season. 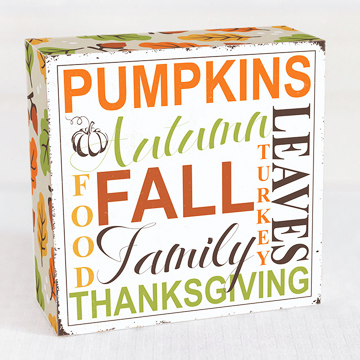 Check out these adorable Fall themed wooden home decor signs, Fall Words & 3 Pumpkins. These signs are all ready to go, no DIY required. Each of these small signs measure 5″ x 5″ x 1.5″. The wooden pumpkins come in a set of 3. We are particularly fond of the three pumpkin signs. If you are into a little DIY, you could temporarily alter these pumpkins to be specific to Halloween. 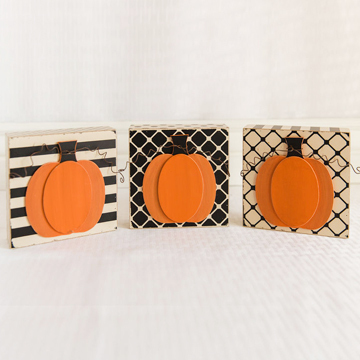 Turn them into darling little jack-o-lanterns with hand cut black cardstock shapes. 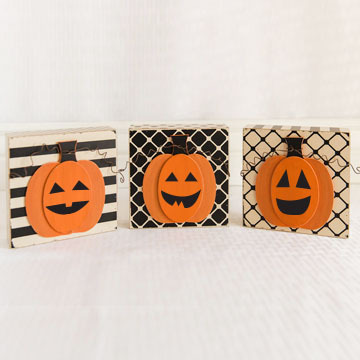 Be sure to use a removable adhesive on the black cardstock, so when you remove the paper, your pumpkin signs are usable throughout the Thanksgiving season. Thanks for stopping by. Don’t forget to check out all the new Home Decor goodies in our online store. Come back soon. This entry was posted in Home Decor, New Seasonal & Special Occasions, Uncategorized and tagged 3 pumpkins, fall words, Home Decor, jack-o-lanterns. Introducing Real Wood Paper Tags!